Dream11 is a fantasy sports platform that gives you the opportunity to create your own team & play Fantasy Cricket, Football, Kabbadi, and NBA and win huge cash prizes. Dream11 is available on the web but you can also download the dream11 app for Android and iOS. So you can create and play fantasy cricket on the go. But, to get your Rs. 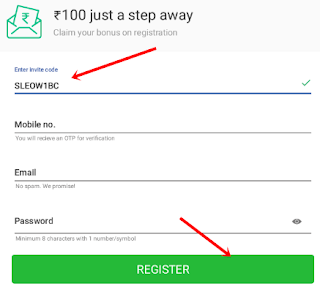 100 cash bonus you need to register on Dream11 App and with a referral code. You can earn up to Rs.100 for each friend that signs up in the app and enters your referral code. So the more users you refer the more you will earn. But remember, don't create multiple accounts to get the refer & earn bonus. That would be a fair play violation and your account will get banned. Your friends will also get Rs.100 when they enter your referral code. For example; when you enter this referral code- DRONK6BC during sign up on the Dream11 app you will get Rs. 100. Refer and earn program is only valid for the Dream11 app. So your friend needs to sign up within the Dream11 app which is available for both iOS and Android to get the joining bonus. 1. Download The Dream11 App. 2. Open the app and tap on the "Have a Referral Code" below 'Lets Play' button. 3. On the next page, enter this Dream11 refer code DRONK6BC, your mobile number, email address, and password. And tap the Register button. 4. You'll receive an OTP to your registered number. Enter the received OTP to Verify your number. 5. Now, verify your email address. You'll get Rs.100 instantly after you verify your email. Select any match from the "Fixtures" tab. You are the SELECTOR. You create your own team. You can select 11 players from both the teams between whom the match is. You have a budget of 100 credits. Each player costs certain credits and you have to select players such that you don't exceed your budget. 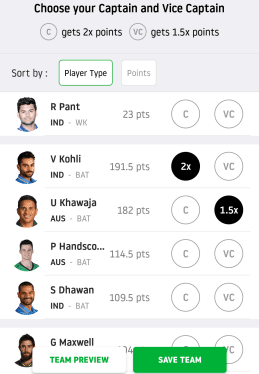 You can select a maximum of 7 players from one team, for example, if the match is between IND and AUS, you can select a maximum of 7 players from IND or AUS. There is also a limit on the maximum number of all-rounders, batsman, and bowler you can pick. I prefer to select all-rounder as captain and vice-captain(if they are performing well). Because they can bowl as well as bat. For a match, you can create as many as 6 teams. You can create and edit your team until the match begins. Before creating your team research about the pitch, is the pitch favorable for bowlers or batsman? Spinners perform better or fast bowlers? Is this pitch a high scoring one? Also, find out about the players that play better on that pitch. Look at the scorecard of both the teams of recent matches. See, the players which are playing better. Don't forget to select 3 all-rounders (if they are performing well), because even if they didn't bat well there is a good chance they might take wickets. Create more than 1 team if you're joining leagues that allow multiple entries. And Last: Most of the time it all depends on luck. In the case of the mega contest: No matter how many hours you spent researching to create your team or teams at the end of the day it all depends on your luck. If your luck is with you even one team can win you thousands else even creating 6 teams won't do you any good. Dream11 has two types of leagues: Cash Leagues and Practice Leagues. To join Cash Leagues you'll need to pay some entry fee. But, practice leagues are free and you won't win money in these leagues. Join some Practice Leagues before going for Cash Leagues. This will give you an idea of how dream11 works and also you'll gain some experience, which will help you win in cash leagues. You can use your referral bonus to join leagues. You can use Rs. 25 or 10% of bonus per match (whichever is higher). New: Now you can join leagues and create/edit teams after the toss. The deadline has been moved to the time when the actual match starts. Also after the line ups are out, you'll be able to see who's playing and who's within the Dream11 app. Results are announced 30-60 minutes after the match has ended. And if you won your winning amount will be added to your winnings. In March 2019, Dream11 introduced a new section: Rewards and Offers. In this section, you'll find coupon codes for various offers. You can enter the coupon code in the Get Coupon tab. Cash Bonus: Use this to join any contest at a lower entry fee. Free Entry: Use this to join particular contests for FREE. Discounted Entry: Use this to join particular contests at a lowered entry fee. Coupons: These can be used only once. Passes: These can be used multiple times. By leveling up you can earn cash bonuses. Each level requires different criteria to be met to level up. For example to reach level; you need to play for about Rs.500 and join 71 contests. Once you have completed these tasks you'll get Rs.20 Cash bonus. You can check your level in the "Me" tab in the Dream11 app. Based on your Dream11 playing history, you will be assigned a level. Join more Cash Contests and keep leveling up. Once you’ve reached Level 3, continue playing in more Cash Contests to Level Up further. Yes, Dream11 is a legit app to play fantasy sports. 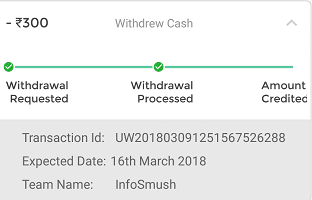 And below is the screenshot of the cash that I withdrew from dream11. It took 1 week for the payment to arrive. Dream11 is the best fantasy sports platform in India. You can play sports like Baseball, cricket, football, and kabaddi. The best part is that when you sign up with a referral code you get a bonus of Rs. 100. You can use this bonus to join leagues win cash.